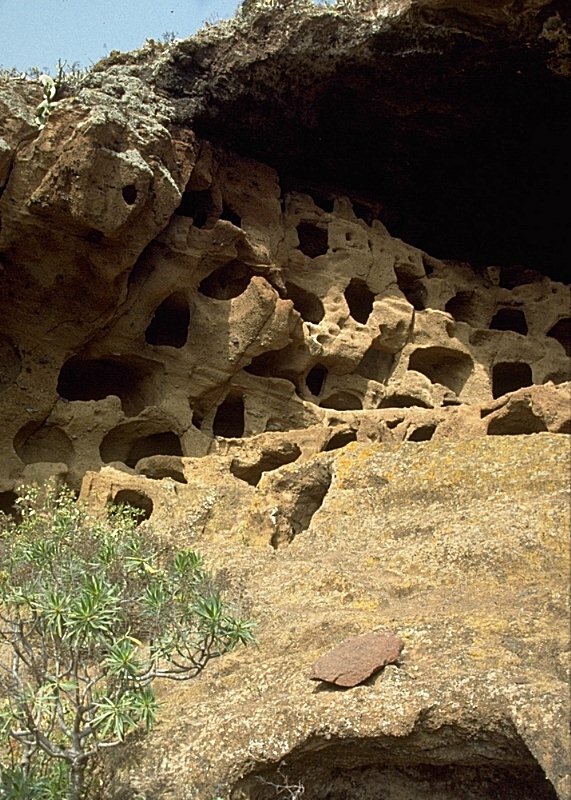 Image: the complete site: numerous small caves in a huge cavern, covered by a lava flow. Location: At the southwest end Guía (Santa Maria de Guía), 28 ms west of Las Palmas, Gran Canaria, Canarias. 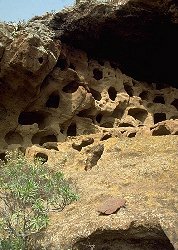 Image: closer view of the caves. Image: inside one of the caves. Cenobio de Valerón is a large basaltic arch, covering volcanic tuff. 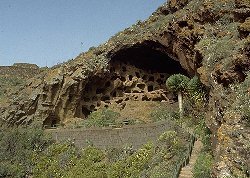 Into this rather soft material, the Guanche excavated about 300 caves, cavities and cubicles. This place is an agadir (a collective-fortificated granary) similar to the agadirs in North Africa. The ancient people stored their agricultural surplus here. The faican, a religious, political and economic chief distributed it between the community. The cavities were used as silos, closed with a wooden plank and marked with a seal called pintadera that indicated the owner. The name Cenobio de Valerón or Convent of Valerón is wrong. The traditional consideration was, that this was a monastery or a place where the harimaguadas (priestesses) were confined. But there is no archaeological evidence for this legend. The visitors reach this place in a few minutes from the well developed coastal highway. A small road winds along a steep valley and runs right below the cenobio. The small parking is only suitable for half a dozen cars, but it seems the typical Gran Canaria tourist is not interested to visit this place, and the this small parking is absolutely sufficient. From the car the road is crossed to fence with a sort of ticket office at the fence. The guard tells you something about protection of the site and helps with some archaeological background info. But there is no fee and you are free to visit the whole site, as long as you stay on the paved paths. The path goes uphill and crosses the whole site right below the cave. Its very fortunate to see the whole site. 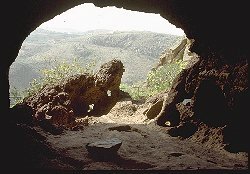 Most of the small caves are not open to visitors, but its possible to have a look in two of them. The wheat holes in the ground, which were closed by a wooden lid, are easy to find. The place is well developed and the guarian uses the spare time to plant local succulents. But the equatiorian sun is very hot, and so a hat, sun glasses and sunblocker are recommended for a visit. 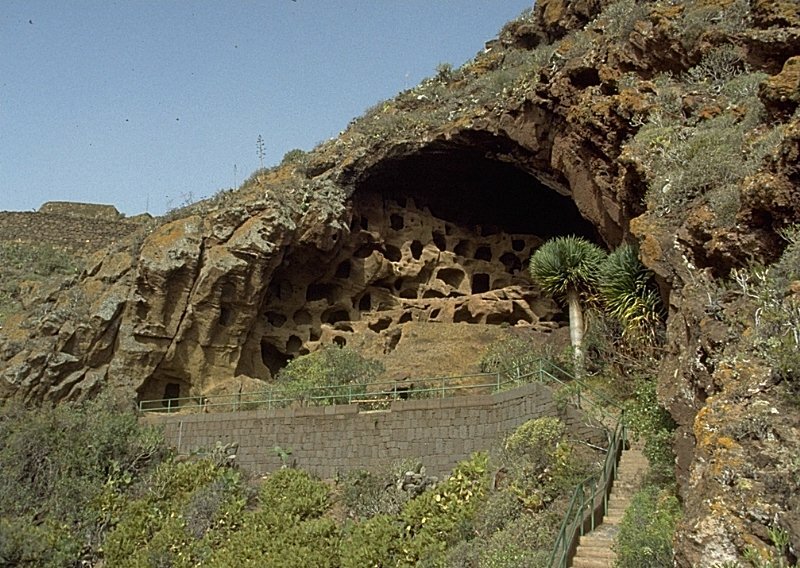 Probably the most beautiful cave-related sight on Gran Canaria and much recommended by our reviewer!